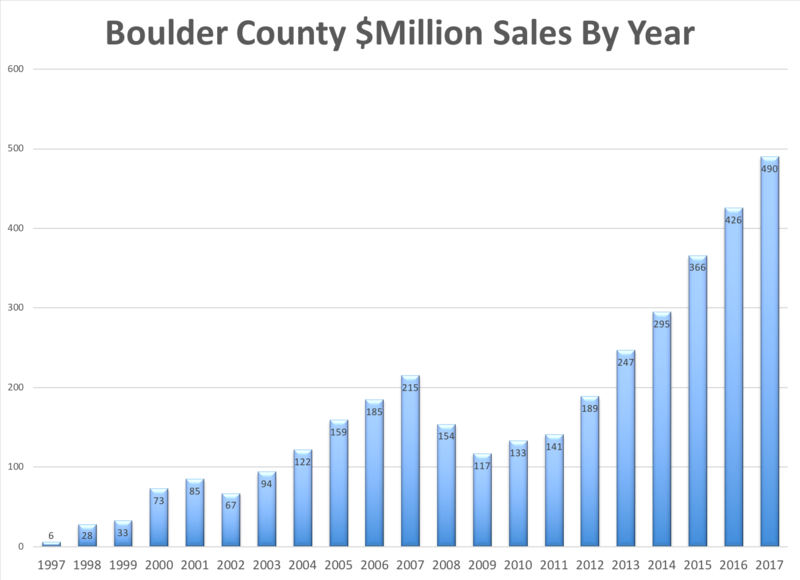 Luxury Market Update | Kearney Realty Co.
2017 was a record year for luxury real estate in Boulder County. During the year a record 490 properties sold for over $1 million. Eclipsing by 15% last years total of 426. As you can see by the chart below, the growth of the luxury market segment in this area has more than doubled since the pre-recession high in 2007. The main factors causing this impressive growth are price appreciation and capital improvement. 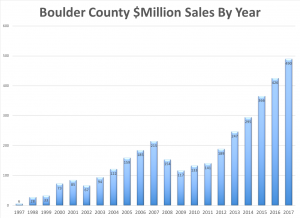 Overall, the average home in Boulder County has appreciated approximately 60% over the past five years. This has naturally brought homes that were not previously considered “luxury” into the $1 million plus range. We have also seen an overall improvement in the housing stock over the past decade. Expensive homes have been built on vacant lots and a significant number of homes have been extensively updated and expanded turning “stock” homes into showcase homes. If you have had any work done recently to your home, you know that contractors are not easy to find and prices for renovations have gone up significantly. Another factor in the quick rise in prices are the required “green” features and high permit fees which add to the cost of construction. The top priced sale for the year in the MLS was $6,700,000 and the median price for all sales over $1,000,000 was $1,370,000. The table below shows the current listings in Boulder County by price range (as of February 24, 2018). Let’s first talk about the orange column which shows the percentage of homes that are currently under contract. Not surprisingly the price ranges below $1 million are very tight. But more surprisingly is the good activity in the luxury market. Below $2 million 36% of active listings are already under contract. Between $2 and $2.5 million it just drops to 28% but above $2.5 million the activity drops significantly with just 6% of those listings having already found a buyer. The blue column shows “months of inventory” which is sometimes called absorption rate. This shows the relation of total homes on the market by price range to the number that have sold over the past year. Basically it measures the flow through the market and tells us how much inventory is backlogged. A low number means a fast moving market and a high number means a slower moving market. According to NAR a balanced market is 6 months of inventory. According to these numbers it is a sellers market to some degree up to $2,000,000. The lower the price range the stronger the sellers market. Over $2,000,000 it becomes an increasingly strong buyers market at least in terms of inventory. On the right below is a breakdown of sales in 2017 by price range (in $ millions). range. A home that was brand new ten years ago can be considered “dated”. Will the New Tax Laws Affect Luxury Real Estate in Boulder County? It may. The two issues involved are mortgage deductibility for loans over $750,000 and the limit of deductibility of local and state taxes including property taxes to $10,000. Our local tax rates are not as high as other area in the country, and from my experience, local buyers tend to bring a lot of cash to a luxury transaction, but these new factors may cause buyers to consider lower priced properties to avoid these tax limitations.